The Condition Of This Compressor Chronograph 2 Is Immaculate With No Signs Of Cosmetic Damage. Please Refer To The Pictures iN Determining The Condition, Pictures Are Of The Exact Watch Being Offered. Jaeger-LeCoultre Box, Papers And Instructional Manual Are Included. Polish Finished Stainless Steel Fixed Bezel And Lugs. Solid Stainless Steel Case Back With A Rose Gold Center Engraved With The Master Compressor Medallion. Brush Finished Stainless Steel Sides. Stainless Steel Crowns With The Jaeger-LeCoultre Patented Compression Key System, Which Ensures Water Resistance To 100 Meters (330 Feet). Black Dial With A Combination Of Applied Stainless Steel Index And Arabic Numeral Hour Markers, Which Are Luminescent Filled. Inner Bezel Has A Tachymeter Scale Which Measures Distance Based On Speed. Featured On The Dial Is A Small Seconds Sub-Dial At The 6 O’Clock Position, 12-Hour Counter For The Chronograph At The 9 O’Clock Position, 30-Minute Counter For The Chronograph At The 3 O’Clock Position And Lastly The 60-Second Counter For The Chronograph Which Is Displayed By The Large Central Red Hand. Jaeger-LeCoultre Black Alligator Skin Strap With Black Stitching On A Jaeger-LeCoultre Stainless Steel Butterfly Clasp. This Model Has The Jaeger-LeCoultre Quick-Change Strap System, Which Allows The Owner To Change The Strap Without Taking It To An Expert. 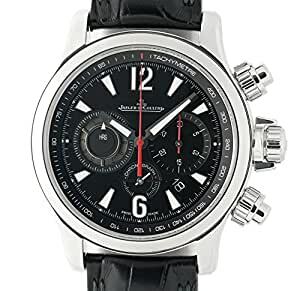 Powered By The Jaeger-LeCoultre Caliber 751/1 Self-Winding Chronograph Movement With An Approximate Power Reserve Of 65 Hours When Fully Wound. This Movement Is Comprised With A Total Of 277 Parts, Contains 39 Jewels And Beats At 28,800 Vibrations Per Hour. A Full One Year Warranty And Certificate Of Authenticity Will Be Issued By Element iN Time NYC.